Description: This armour type was originally designed prior to the US acquisition of advance technologies from our Area 51 base. 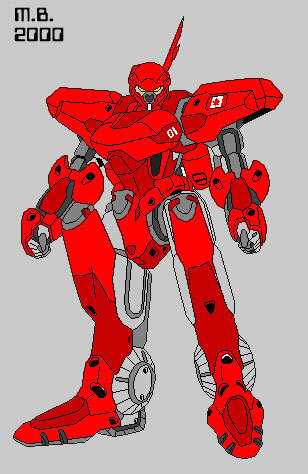 So it possesses none of the more advance armour technologies utilized by the Green series on up, this allows the US to easily sell this armour to our allies without fear of letting any of our enemies, or competitors, getting access to our more advance armour technologies, but despite its technological limitations. The armour has proven itself a very versatile and powerful weapon that should serve our soldiers well in the ongoing war against Chronos and has shown itself capable of killing most low level zoanoids with relative ease. -Stamina: Unit possesses advance, twin eject-able, micro fusion power reactors as its primary power source. Fuel is hydrogen based and is stored throughout armour within a porous cellular membrane that prevents ignition of fuel prior to its use, additional fuel is extracted from the air via molecular sieve vents. This gives armour extensive reserves and operational range, though actual limits are determined by how the armour is used as fuel is also used to power armour’s propulsion systems, the armour can operate at maximum power for a limit of two hours without refuelling but standard operational use allows armour to be used for up to 48 hours without refuelling. The armour also has auxiliary power systems that include a highly efficient fuel cell and several mega watt capacity dynamo type capacitors for emergency power boosts. This US version comes standard with a third micro fusion power reactor for an additional 33% overall power, though this increases units fuel consumption, this armour type also has a detachable auxiliary fuel cell to compensate. -Weapon Systems: Armours Gauntlets, which possess additional shielding, can be combined with armours advance thruster system to allow for a power attack similar to a Gigantic Guyvers power punch. Additionally the Gauntlets can be quickly extended for a distance of three feet with high powered hydraulics for additional reach. Other options include actual firing of Gauntlets while tethered to unit via a fast retract cable system that also allows armour to channel its full electrical power to its target and then quickly pull back the Gauntlets into place. The final option is to fire the Gauntlets without the cable, in this mode the Gauntlets essentially become self guided missiles, and let it explode on impact for a last ditch long range attack. The power of each attack option varies upon its successful application but can easily equal the power of an armour piercing tank shell or approximately as powerful as a Guyver Pressure Cannon when both Gauntlets are used. -Physical Strength: Armour has the approximated strength of 20 men, making armour 30% stronger than a Gregore type zoanoid, though armour has advance thruster design that allows it to boost strength to that of 30 men for short bursts and/or power attacks. Alternatively the armour can use its auxiliary power systems, as well as divert its shield energy, to boost its strength by 25% but this renders armour more vulnerable to attack, though not as much as the Blue V1 series due to the additional micro fusion power reactor, and increases the wear and tear on the armour, thus reducing its operational range significantly. -Durability: Armour is lighter than the US Blue type V1 armour but improved structural design, and materials, which gives it the same durability. Armour also has an energy shield system derived from previously theoretical Earth based technology designs, allowing unit to maintain a low level shielding to boost its durability so it can withstand anything up to a Vamore bio laser blast for at least one direct hit, and doesn’t use any of the technologies the US acquired from Area 51. This allows armour to have an acceptable durability rating without threatening the US monopoly on advance armour technologies. This and the US version of the Wolf series armour, have the added ability to focus its shielding for increased effectiveness against directed attacks but it only provides unit with an additional 50% protection from its shields, even with the additional power from its third micro fusion power reactor. -Speed: Armour does not enhance its users reflexes but has a superior range of mobility compared to the US Blue armour type V1. Advance thruster systems allow for both strength enhancements and high acceleration rates for delivering physical attacks. When in hover mode, armour can reach speeds up to 225 MPH. In flight mode, armour can reach speeds up to 375 MPH but can divert all power to propulsion for a top speed of 450 MPH but is unable to defend itself while in this mode, as both power requirements and flight dynamics prevent it, unless unit is only hovering. -Upgrades: The armour was not designed to be directly upgraded but the unit is dexterous enough to handle standard weaponry that has been modified to accommodate the armours size. Though the US does offer its allies the option to have a customized unit(s) built, the price is increased from 10 million US dollars to 20 million. Modifications basically consist of having Blue type V1 armour weapon systems built into unit, but removes the ability to fire Gauntlets, along with an additional micro fusion reactor to help power weapons and increase shield power by 20%. So specialized versions of this armour type are not expected to be deployed in large numbers, at least outside of the US and Canadian territories.